TO BOOK A WADI EL GEMAL EXCURSION OR ONE OF THE SAFARI PACKAGES PLEASE EMAIL STEVEN@MARSAALAM.COM. MORE INFORMATION ON THE SAFARI EXCURSIONS OFFERED IS PROVIDED AT THE BOTTOM OF THE LEFT HAND COLUMN. The Wadi El Gemal Nationa Park ( meaning "Valley of the Camels" ) is an extensive area of land and coastal water lying to the south of Marsa Alam. It includes many diverse ecological habitats and a rich variety of animal and bird types including several endangered species. The area was designated a National Park by the Egyptian Environmental Affairs Agency in January 2003. It covers a total of some 5,000 square kilometres including several islands, a stretch of mangrove rich coast line and an extensive mountainous area inland which surround one of Egypt's largest desert wadis. The Wadi El Gemal acts to channel any water from the mountains towards the coastline but some is trapped underground which is a key factor supporting the area's vibrant ecosystem. I recommend you contact Steven via his email at steven@marsaalam.com who will put you in contact with an experienced and licensed local tour guide. It's a seemingly dry desert river valley which only floods when occasionally the desert experiences a heavy rainfall. Some water however percolates down into the surrounding mountains and experienced locals are able to know how to access this water through local springs and wells. In this area the local population is the Ababda bedouin who have many rich and colourful traditions - much of which is endangered by the pressures of modern life and the economic exploitation of the area and its' rescources. The wadi has long been known as an area rich in minerals and here you can find the world's oldest emerald mine dating back to pre-Roman times. There are also rich deposits of gold and lead in the area and just outside the National Park boundary lies Egypt's most productive gold mine at Sukari -some 23km west of Marsa Alam close to the road which connects the town with Esna on the Nile. The ancient emerald mining settlements can still be seen if you go on an organized safari tour. The most well known is the Roman settlement of Sakit which they called Mons Smaragdus or Emerald Mountain. You can wonder through the village, see a temple dedicated to the god Isis cut out of the rock and also visit the actual mines. If you have time you can also visit the Roman town of Umm Kabu where the emeralds brought down from the mountains were prepared for transportation inland to the Nile from where they would be sent North towards Alexandria before being shipped across the Mediterranean to Rome. You can also visit the emerald processing town of Marfuah where there is a nearby hill with great panoramic views over the surrounding area. Other sites include the emerald processing town of Marfuah where there is a nearby hill with great panoramic views over the surrounding area and Appollonia, where you can view the ruins of an ancient Roman fort. The ecolodge or "fustat" (one of several Arabic terms for tented encampment ) lies just a short distance from the main entrance on the coastal road and was built in 2005 using traditional materials and architecture. Its' staff are employed to educate visiting tourists on the ecology, geology and history of the valley. Apart from a restaurant it also has a small cinema where visitors can view a documentary about the area and its' wildlife, inhabitants and history. Near the mouth of the wadi there is a small delta and marsh of around 500 square metres. Here is where the water from a fresh water spring combines with sea water and also deposits of alluvial sediment brought down thousands of years ago during the wetter Pleistocene period. Some types of vegetation, which are relatively salt tolerant, flourish. These include mangrove, Tamarisk trees and Salvadora Persica, better known as the Toothbrush Tree, as traditionally its' twigs were used for toothbrushes. Wildcats, foxes and gazelle can often be seen here due to the relative abundance of fresh water. Mangroves can tolerate relatively salty water because their roots filter the sea water and the salt crystals are excreted through their leaves and if you look at a Mangrove leaf under the sun you can often see the shiny salt water crystals on it. Mangrove performs a crucial role in the coast's eco system by providing protection for birdlife and is one of the few places in the desert environment suitable for nesting. Its' cover also enables baby fish to hide from predators and their roots protect the coast from erosion and were also traditionally used by the bedouin for house construction and its' foliage as an animal feed. Further up the wadi you can find acacia trees usually along the edges of the valley floor. These have evolved over thousands of years to survive the arid conditions of the desert with extraordinarily long roots enabling them to reach the ground water deep below the surface. This species of gazelle can be found in a few southerly areas of Egypt's Eastern Desert region and the Wadi El Gemal area is probably the most likely place that you will be able to find them. They are adept at desert survival, being able to absorb moisture from the vegetation they eat. With it's beautiful coral reefs, extensive sea grass beds, crystal clear waters, and amazing wildlife this island is one of the top destinations for visitors. You can get there by a day boat from Shams Alam diving centre. Steven can arrange this for you - email steven@marsaalam.com. The island is a haven for dugongs, turtles and a vast variety of migrating sea birds and has been designated as "an important bird area" by Bird Life International. In order to ensure the Island's fragile ecology only twenty tourists are allowed to visit the island at a time for a maximum of three hours and only during daylight hours. The Green turtle live and breed in the coastal waters and on the mainland and island beaches of the Wadi el Gamel National Park. They are the only known sea turtle that is totally herbivorous and some are thought to live up to a hundred years and can weith up to 140kg - that twice the average human weight ! The area supports a fascinating variety of vegetation. If you are an amateur botanist or want to learn more you can obtain a book on plant life in the Wadi El Gemal National Park from the American University in Cairo Press. 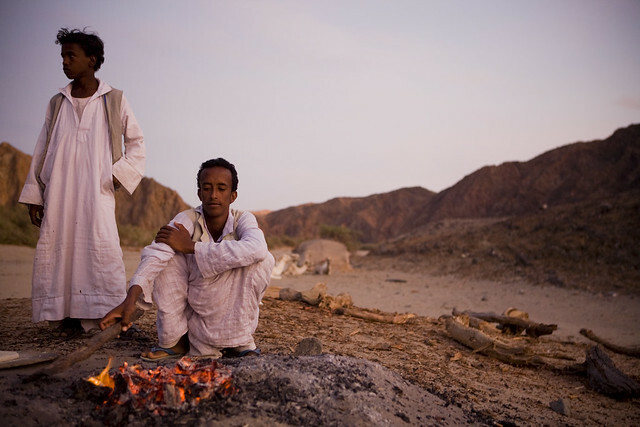 The author, Tamer Mahmoud, documents how the local population use the vegetation of the wadi for fodder, medicine, fuel and food. Steven's taxis can arrange a private safari trip to the park which can be designed around what you want but might typically include, if it is a half day trip from your hotel, exploring the valley with its mangrove and acacia trees and a visit the ancient emerald mines and the ancient Egyptian temple built during the Roman period. Trips usually include at least lunch, tea and soft drinks but Seifein can usually tailor make a package to suit your interests. After your trip around some of the highlights of the valley you can enjoy a cool-off swim at Gullan Bay prior to your return transfer to your hotel. For more information contact Steven at steven@marsaalam.com and let him know what sort of trip you would like and he will give you a price and confirm in writing what's included. The main entrance to Wadi El Gemal is situated 45km south of Marsa Alam town while Sheikh Malik is located around 75km north and is therefore more suited to hotels in the El Quseir region. Please let Steven know if you have a preference. There are also some alternatives to the Wadi El Gamal Excursion which might be more suitable depending on the location of your hotel, your budget and your interests. The locations of these often change due to the seasons and availability. These trips are normally available every day of the week except for Saturdays and Sundays. The amazing survival abilities of the Acacia explained. June 2011 - 4.05 minutes - over 5,700 views. Photo slide show of Bedouin life in the Valley set to traditional music. November 2010 - 3.20 minutes - over 1,100 views. 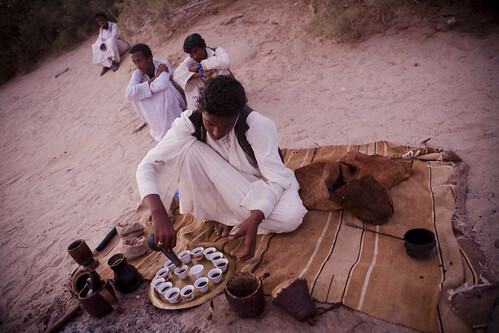 Local Bedouin man explains traditional bread making. Park sign close to the coastal road. Mangrove expert Motohiko Kogo explains the vital importance of Mangrove to the delicate desert ecology. June 2009 - 6.23 minutes. Another resident of the valley - the Nubian Ibex. Fascinating BBC documentary clip on the Green Turtle. November 2008 - 3.58 minutes - over 26,000 views. BY HOSAM EL-HAMALAWY ON FLICKR - NOVEMBER 2011.